Clouded Leopard Anatomy, habitat, distribution, feeding, reproduction, evolution, social structure, conservation. 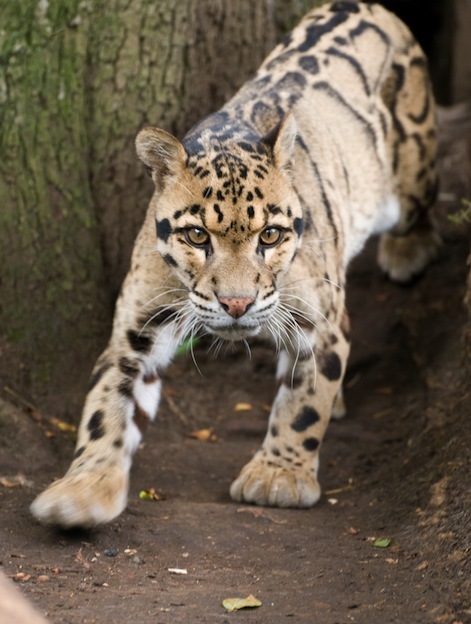 Clouded Leopard images, videos and top facts. One of the medium sized felines is the Clouded Leopard. It has a beautiful tan coat with very distinctive black markings on it. They often appear to be like clouds, thus where their name comes from. When you take a close look at it, the Clouded Leopard offers many features of some of the big cats as well as the smaller cats. What is interesting though is that in spite of its name, it isn’t genetically related to the Leopard at all. This particular feline weighs from 25 to 50 pounds. They have very high shoulders that also offer them plenty of strength. They have canine teeth that are very long. They have short and powerful legs. They can quickly climb with speed and agility into the trees. The tail can be almost as long as the entire body and that aids in their overall balancing abilities. It can even run head first back down the trees! The Clouded Leopard is found in Southeast Asia. They are found exploring through China and into the far North area of Wuyi Shan. They are located in the Eastern Himalayas and The Western area of Malaysia. Some of them are also living in Nepal and Indochina. They once lived in Taiwan but are no extinct in that region. They live in both the tropic and subtropical areas. They tend to stay at altitudes around 9,800 feet. Yet some of them do live in the swamps and grassland areas that are well below that. There isn’t much at all known about the behaviors of the Clouded Leopard in the wild. The information we have about them comes from what has been observed with them in captivity. They are known to be solitary animals though that will only meet up for mating purposes. The diet of the Clouded Leopard is very diverse. They are opportunistic so they will feed on just about anything that they can get in their environment. This includes monkeys, deer, birds, fish and rodents. They also consume domestic livestock which creates problems for them and humans. Since they are excellent climbers they often go into trees to find their prey. This gives them quite an advantage over those animals that are only able to hunt on land. The mating rituals for the Clouded Leopard aren’t known. It is believed that the scent of the female becomes stronger and that attracts the males to her. After mating she will give birth about 85 to 95 days later. A litter is up to three young kittens, but five have been documented. They will grow very quickly and by the time they are 10 months old they will be caring for themselves. The average lifespan for the Clouded Leopard is 11 years in the wild. In captivity they can live up to 17 years. It is believed that only about 10,000 of them remain in the wild today. There is a huge concern over the low number of Clouded Leopards in the wild. They are heavily hunted due to the great coloring of their fur. They are also losing their natural habitat as humans take over such areas. Breeding programs in captivity have been unsuccessful in the past. However, better programs that focus on creating a very realistic environment for the felines has reduced stress levels. As a result they have been more successful with breeding. In 2011, approx. 200 clouded leopards lived in zoos.